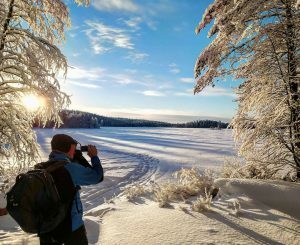 Winter season 2015-2016 has included many beautiful moments and days spent outdoors once again but here´s a bit more detail about one tailored, 8-day trip that took place two weeks back. 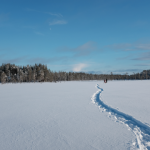 Stephanie and Timo from Zurich contacted me, willing to travel to Hossa and experience a private adventure in the north and try out some new outdoor activities. The best way to explore a new destination and head outdoors with is a small group of people, so I was more than happy to arrange and guide a trip like this, a trip that ended up being maybe the most unforgettable this winter if I would have to pick one. 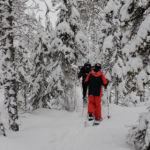 It was only the three of us, amazing winter conditions and a vast wilderness around to explore. 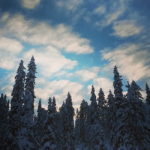 We visited the Colored rock of Hossa by snowmobile to kick our week off with a thrill and did three separate snowshoe hikes, starting right from the doorstep of our cabin, on the Vieremänsuo mire reserve the following days with distances varying between 5-10 km. Second walking day we didn´t hike that much, just enough to reach one lake situated at the heart of this protected area, tried our luck with ice-fishing and had an outdoor lunch by the campfire. 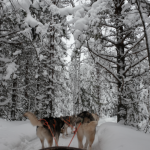 Snow conditions set some limits on our walks as the snow was up to one meter deep and really soft inside the forest and made the walking really demanding, but then again it was hard and carried your weight really well in the open area. 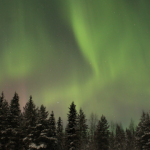 This day we were able to witness the northern winter in its most astonishing beauty as the sky was lit up by the northern lights in the evening. 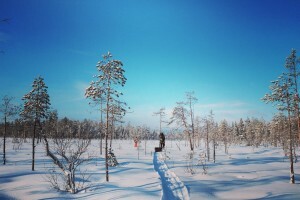 After the cold yet very beautiful sunny day with an exceptionally thick layer of fresh snow covering the Taiga forest and creating fairytale-like sceneries, this truly crowned the experience. 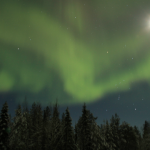 After enjoying the Finnish sauna and having dinner, to step outside and see the sky taken over by this magical green light… Had to take a few photos but then put the camera down, sit back and enjoy the awe-inspiring show. 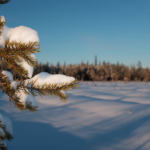 Exploring this vast area of pristine wilderness where old forests and wet swamps alternate and plenty of wildlife roam (saw tracks of capercaillie, elks, foxes, black woodpeckers, pine marten, ermine…) provides such an unique outdoor experience, simply because of the remoteness and stillness that one reaches here. Small groups also have the privilege to taste some of the truly special wild delicacies that we have picked and preserved by hand from the surrounding forests so it was blueberry smoothies for breakfast, sautéed reindeer (from our own farm) for dinner and chaga-tea in the evening for example. 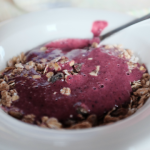 Some of these wild edibles are simply so hard to obtain that they stay as a specialty for groups of few people only, but in general most of the food we serve on our tours is focused on using pure, top quality local ingredients to make sure you get to taste the best of Finnish cuisine meaning game meat, berries and mushrooms to mention a few. 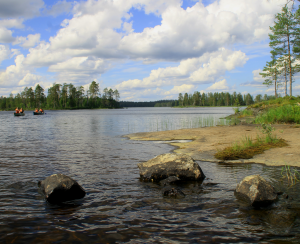 This is something were are proud of and what is as integral part of Finnish culture also. 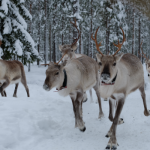 One highlight followed after the snowshoeing as we spent a day on our private reindeer farm, feeding the herd of up to 80 animals and learning about this local tradition that is still a big part of daily life for many people living in the region. 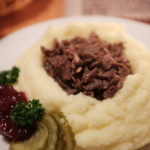 This day trip included a special evening dinner with mashed potatoes, lingonberry-jam and sautéed reindeer; a dish that everyone should give a taste while visiting the northern Finland. 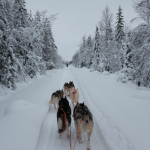 Our week together was finished off with two separate, daily dog-sled rides, other in Hossa and the other near Kuusamo where we also went to visit the Ruka skiresort 25km away and explored this very typical small northern town of 15000 inhabitants. 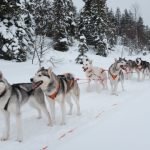 Husky-safari is a nice activity to try out while here and it sure is great to be pulled through the snowy woods by your own team of sled-dogs; haven´t seen too many people return from a sled-ride with an unhappy face. Once again people living in a big mid-European city found this kind of active outdoor holiday in the sparsely-populated north a very pleasant one; being able to try out new activities, do physical exercise and learn new skills, confront a perfect stillness in a remote off-grid cabin and face a different culture from an inside perspective together create an unique experience. Tours like this are not for everyone as one has to be able to stand slight discomfort at times due to varying conditions, the fact that there´s no electricity/running water every single night and no internet-coverage all around. But if you have the guts to be exposed to conditions out of your comfort-zone and let go of the familiar you find yourself being more involved, more present in the action and will for sure have a refreshing holiday, surrounded by wilderness.